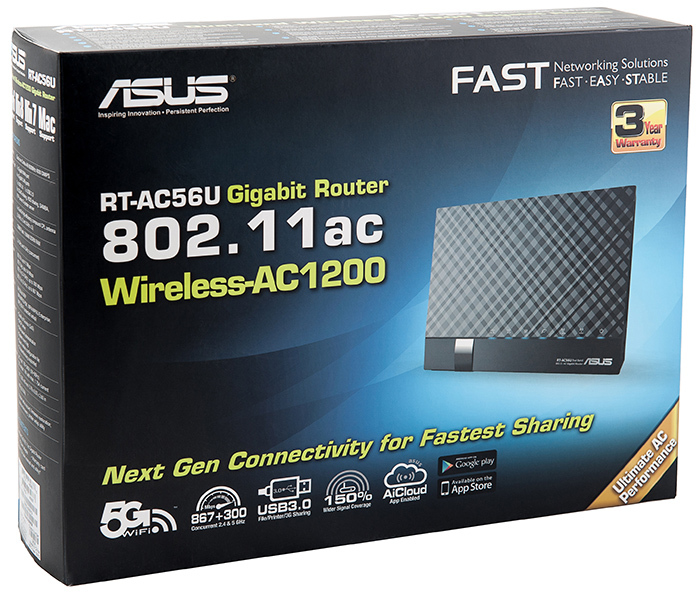 Today our test lab hosts ASUS RT-AC56U wireless router that possesses Gigabit Ethernet wired ports and wireless module that supports wireless data transfer speeds of up to 1167 Mbps. Let's now pass on to reviewing the model! 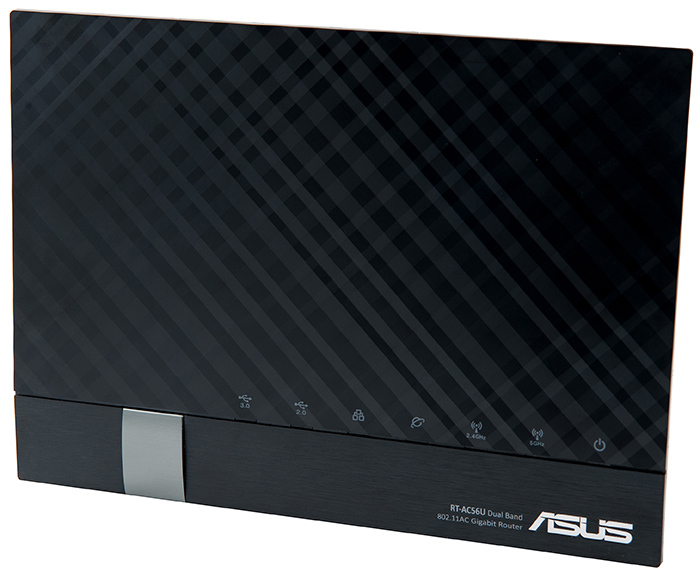 ASUS RT-AC56U wireless router can only be placed on a desk vertically. Its black plastic case has dimensions of 147х205х66 mm. To work properly the device needs an external power unit (included in the box) with the following characteristics: 19V and 1.75А. The front panel has LEDs indicating the device status as well those of its wired ports and wireless networks. Apart from all of it, there is also the model name and brand tag located over here. The biggest part of the side panels of the case is a ventilation grate. One of them also has two buttons: one which enables/disables WPS, facilitating adjustment of the wireless clients, and the other one that switches the wireless network on or off. The same can be done using the web-interface, but the button on the device case may sometimes be more convenient for the user. The upper and bottom panels have a ventilation grate located on them. Also, there is a metal leg attached to the bottom panel. The biggest part of the rear panel of the case is also a ventilation grate. A sticker with brief information about the device is located on the other part of the panel. Also, there are four LAN Gigabit Ethernet and one WAN port powered by the same channel technology, one USB 2.0 and one USB 3.0 port, power socket with an ON/OFF switch, and sunken Reset button located over here. Now let's have a look at the insides of the router case. The electronic stuffing of the device is located on one crimson textolite card, which is half-covered by the heat sink. The only module accessible for inspection was the Spansion S34ML01G100TF100 flash memory module with the size of 128 Mbytes. 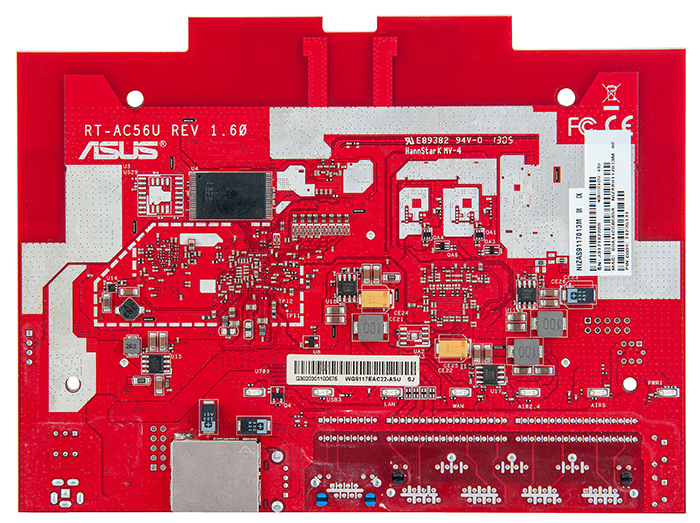 That is where we bring the review of the hardware platform of ASUS RT-AC56U wireless router to a conclusion and pass on to examining its software capabilities. 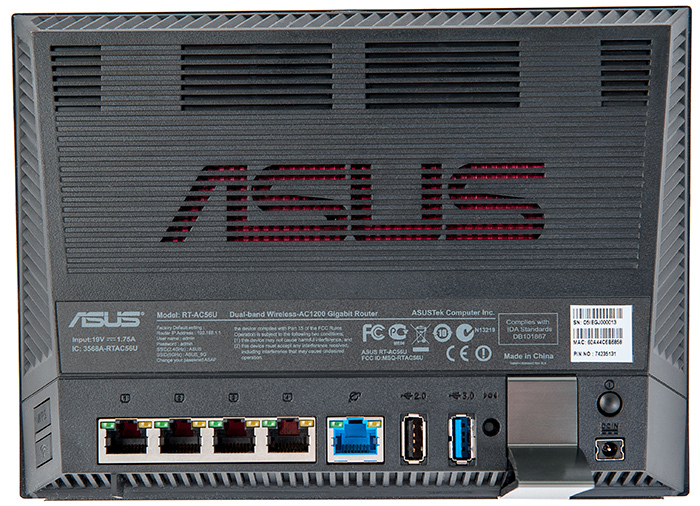 Once the new ASUS RT-AC56U wireless router has been connected to the network, one will be able to access it using any modern browser just by entering 192.168.1.1 IP-address. Upon first successful authentication the user will find him/herself on the quick Internet setup wizard page, where s/he will need to answer several standard questions. We would like to recommend users to upgrade the firmware to the latest stable version as soon as the primary setup of the router is done. Firmware upgrade may be carried out either in the manual or semi-automatic mode using Firmware Upgrade tab, Administration menu item. 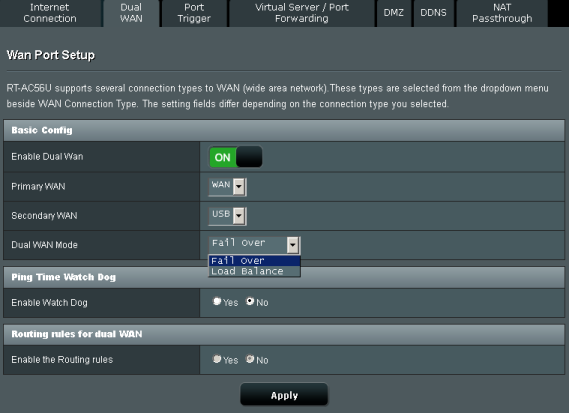 If the connection to the WAN is available, the router can automatically download the firmware and upgrade it after the user clicks on Check button. The administrator can also perform the firmware upgrade manually. In order to do that s/he will need to download the file with the new firmware beforehand. 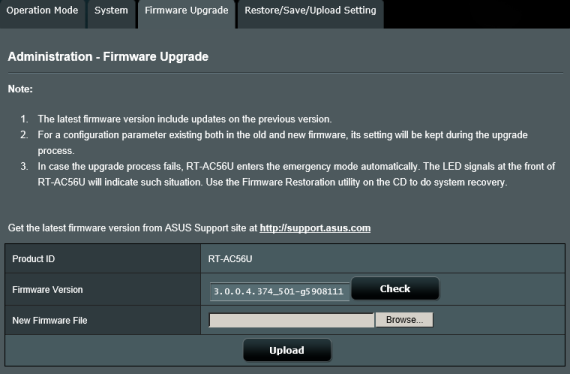 The whole upgrade procedure takes about three minutes (not considering the firmware download time). 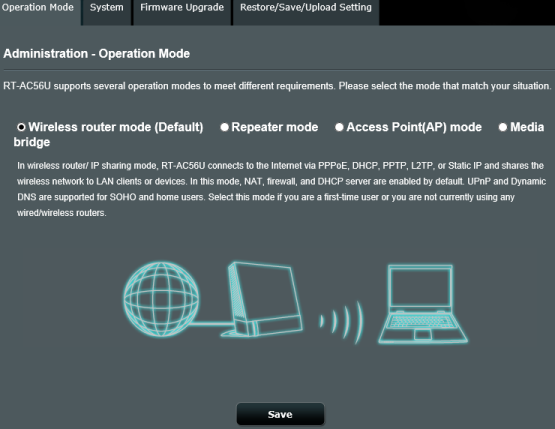 In case of a failure during the firmware upgrade process, the router changes for the rescue mode during which the Power indicator on the device front will be slowly flashing. The administrator can manually switch the device over to the rescue mode. To do that s/he only needs to hold Reset button for ten seconds while the device is booting. One can repair the firmware of a device in the rescue mode using the HTTP server embedded in the boot loader. If the administrator chooses to repair the firmware this way, s/he will need to enter 192.168.1.1 IP-address using any modern browser, specify the direction to the applicable firmware file, click on Upload, and reboot the device when asked to. It's worth mentioning that over here the administrator can also reset the user settings and reboot the device. When this article was being written, the only utility available was Device Discovery, which allowed detecting ASUS wireless equipment within a LAN. 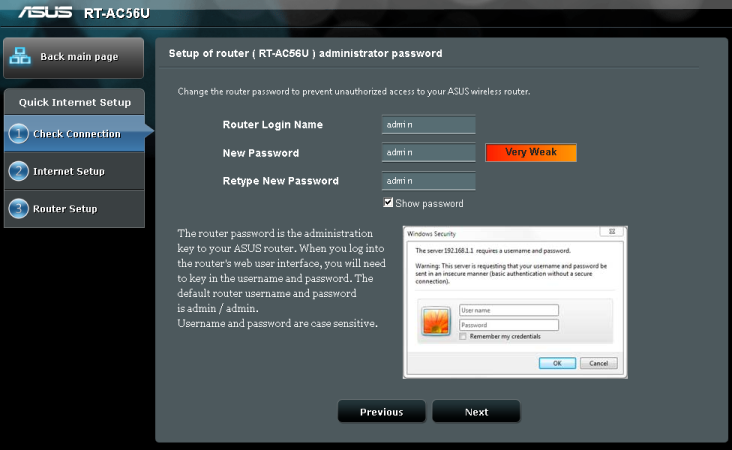 Let's now review certain capabilities of the wireless router web-interface. 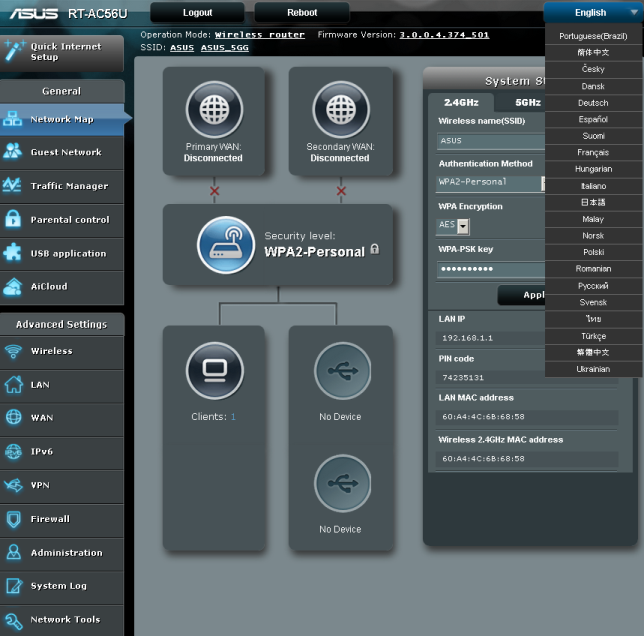 Web-interface capabilities of routers built on ASUS-WRT firmware are very similar. We already reviewed the basic settings of various ASUS models available to users via the web-interface and therefore in this article we will focus our attention only on the new and most interesting of them. 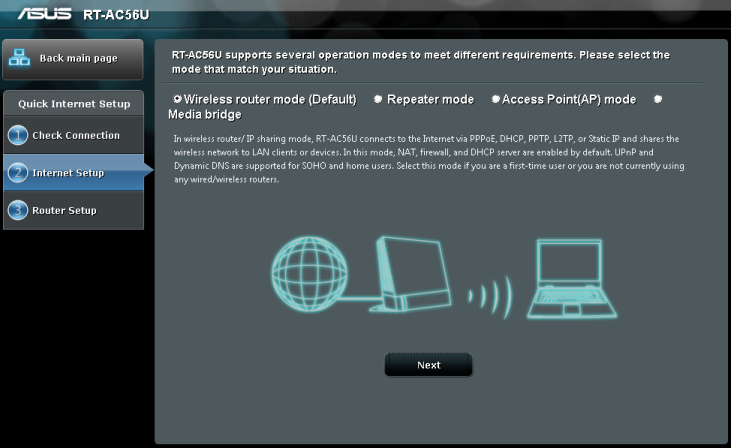 The web-interface of ASUS RT-AC56U wireless router is available in 23 languages. 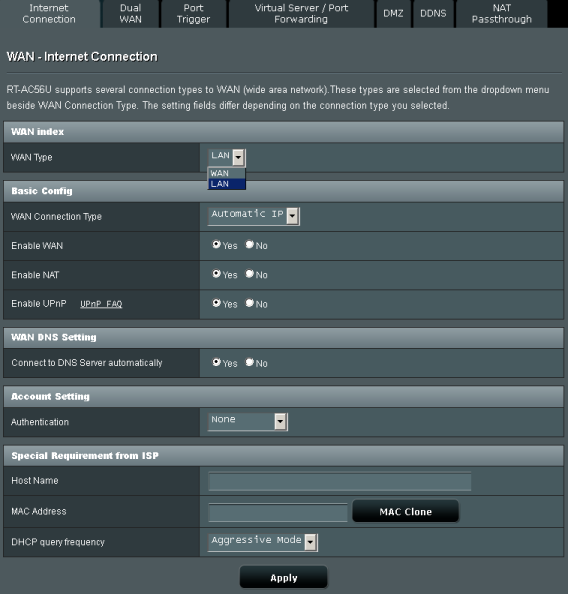 One of the device LAN ports may be used for connection of IPTV consoles; the applicable settings are available in IPTV tab, LAN menu item. The administrator can enable or disable support of Jumbo frames and routing hardware acceleration in Switch Control tab in the same menu item. In the latest firmware versions the user is offered to choose the hardware acceleration level: Level 1 CTF or Level 2 CTF. CTF stands for Cut-Through Forwarding. Unfortunately, so far there are no technical data about the difference of these levels available. It was only known that CTF Level 1 is solely a software practice available on any hardware by Broadcom, whilst CTF Level 2 is a software and hardware acceleration practice used for certain chips that support this level of acceleration. Sometimes usage of CTF Level 2 can cause problems if certain non-standard network protocols are used. 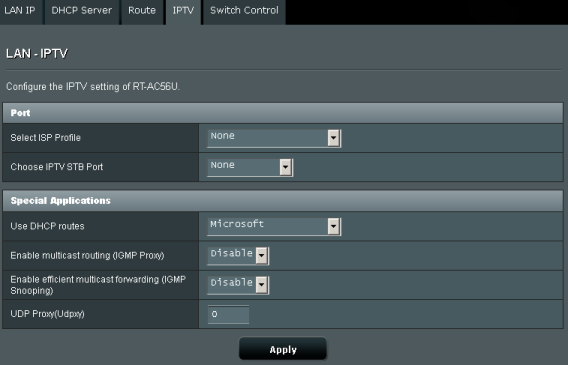 Currently almost all ASUS-WRT firmwares will have a feature that will let the administrator use one of the device LAN ports as the second WAN port; the corresponding settings are available in Dual WAN tab, WAN menu item. Apart from the LAN port, a USB port with the 3G/4G modem connected to it can also be used for this. The second external port can be used for backing up or load balancing. 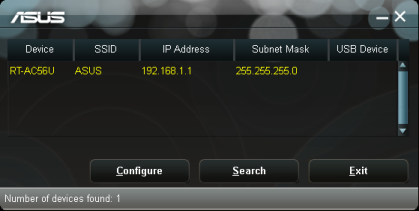 Once the second WAN port has been activated, the user will be able to choose the port to be set up in Internet Connection tab. Upon connection to the provider using a LAN port instead of WAN, the administrator will be able to reduce the frequency at which the DHCP queries are sent out (DHCP query frequency feature). This setting may come in handy when the provider blocks those users whose routers are sending out the queries too often. 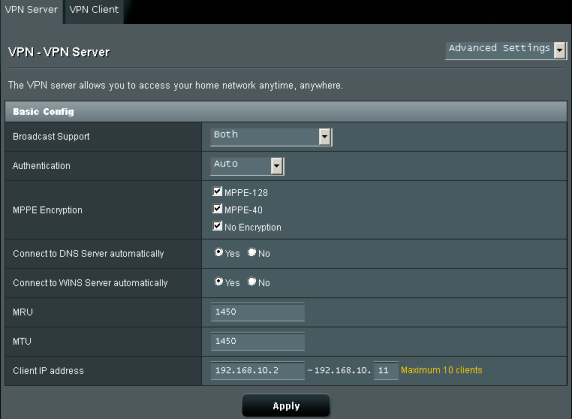 The user can manage the IPv6 operation parameters using the same-named menu item. It's worth noticing that when the article was being written, the only thing that support of this protocol entailed was routing of IPv6 packets. It is not possible to access the web-interface and data stored on the HDD through IPv6. 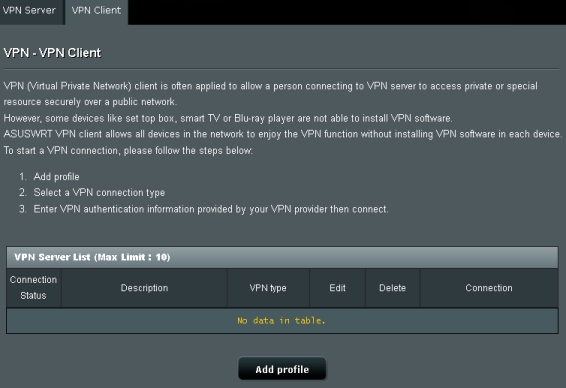 The built-in VPN client and server had also experienced some changes (VPN menu item). 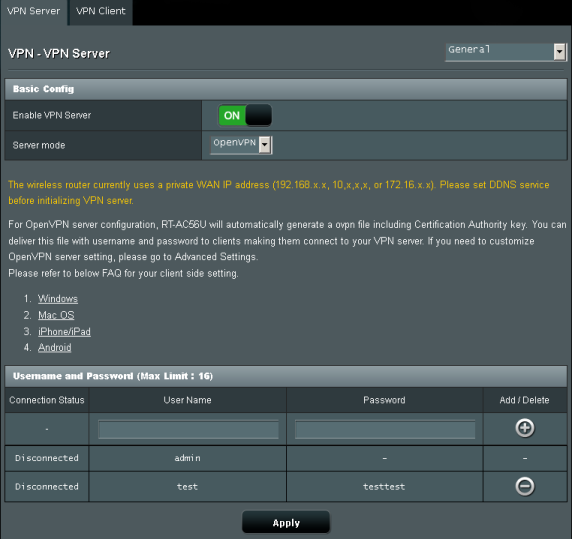 Now the VPN server supports two protocols: PPTP and OpenVPN. The amount of protocols supported by the VPN client got bigger and now they are three: PPTP, L2TP, and OpenVPN. The number of the device operation modes has also been increased: wireless router, repeater, access point, and wireless bridge. 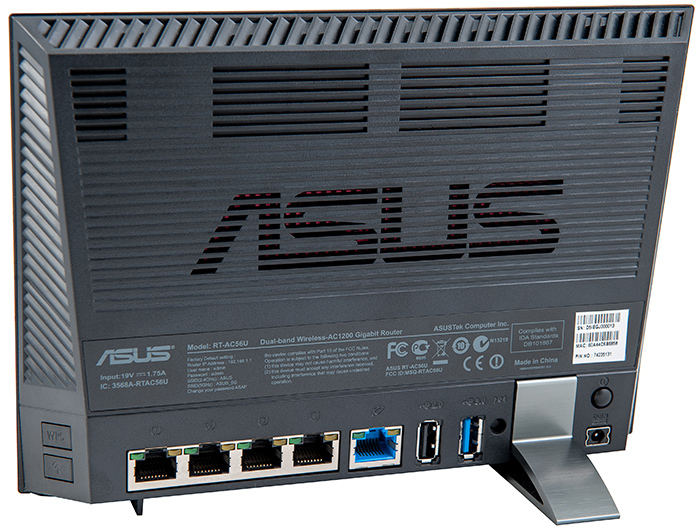 That is where we bring a brief review of ASUS RT-AC56U router web-interface capabilities to a conclusion and pass on to examining capabilities of its command line. Switching the access to the command line on and off is performed using System tab, Administration group. In order to access the command line using telnet protocol one needs to enter the same login and password as for the connection to the device web-interface. Traditionally, BusyBox is intalled in Linux 2.6.36.4 system. BusyBox v1.17.4 (2013-11-05 19:29:28 CST) multi-call binary. Sysinfo utility from /usr/sbin catalogue shows detailed information on the device and its settings. We decided to present the utility output in an individual file. The first testing procedure we traditionally begin our testing section with is estimating the booting time of the device, which is a time interval starting with the moment when the power is on until the first echo reply is received through ICMP. 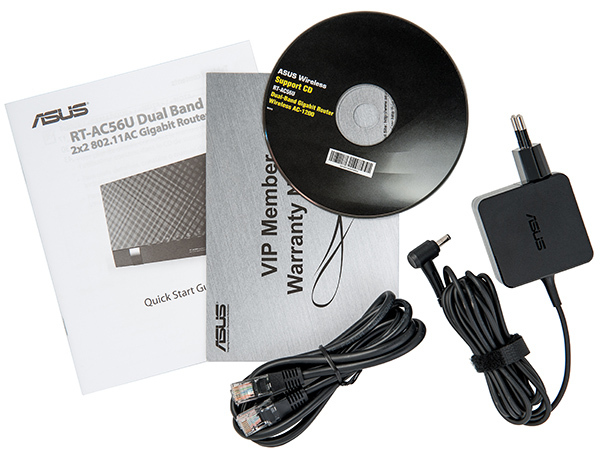 ASUS RT-AC56U wireless router boots in 41 seconds. We believe that the result is decent. The second test was a security scanning procedure, which has been carried out using Positive Technologies XSpider 7.7 (Demo build 3100) utility. On the whole, there were twelve open ports discovered, and they are TCP-53 (DNS), UDP-53 (DNS), TCP-80 (HTTP), TCP-515 (printer), TCP-1990 (Blocked), TCP-3394 (d2k-tapestry2), TCP-3838 (Unavailable), TCP-5473 (unknown), TCP-9100 (Unavailable), TCP-9998 (Unavailable), TCP-18017 (HTTP), and TCP-60756 (HTTP). The most interesting data are presented below. We decided to begin our measurements with the wired segment by identifying the speed with which RT-AC56U routes user traffic between WAN and LAN interfaces with NAT/PAT translations and without them. This diagram also features routing speeds of IPv6 traffic. 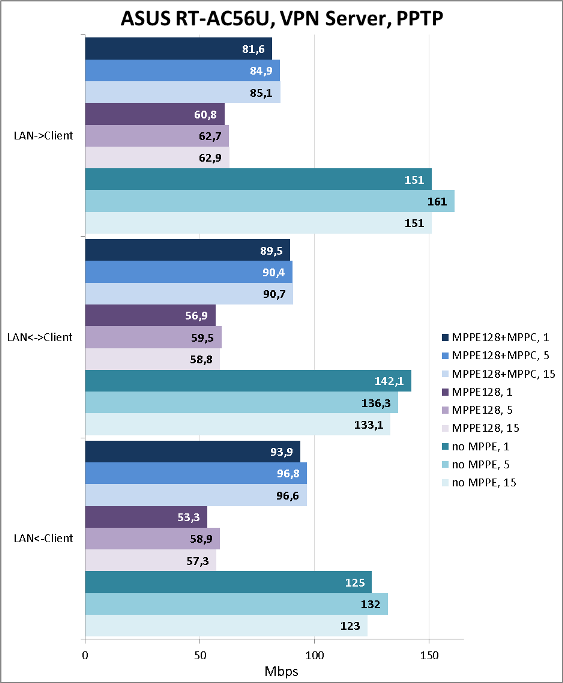 The measurements were taking using JPerft 2.0.2 utility for 1, 5, and 15 concurrent TCP-sessions. 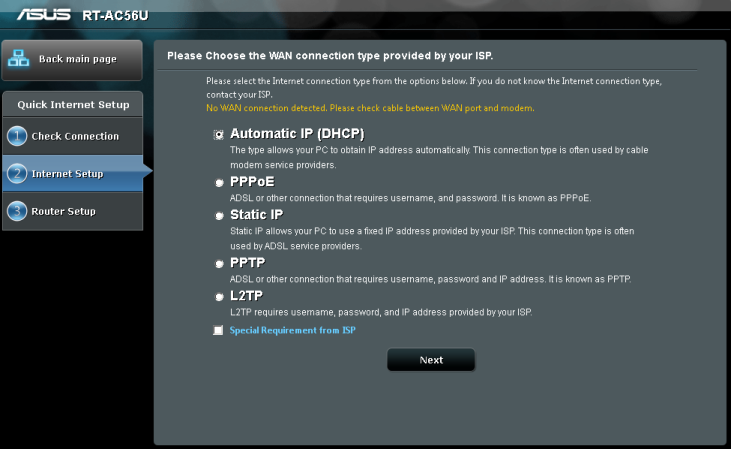 The wireless router under review can get connected to the provider using PPTP. As a matter of course, we couldn't help but review this feature, which is so sought-after in Russia and the CIS. The measurements were made in three different modes: without encryption, with encryption but without compression, and both with encryption and compression. We also decided to test access speeds to the data stored on an external HDD connected through USB. In order to carry out this test we used 750 GB Transcend StoreJet 25M3 external data carrier. Results of the measurements are presented on the diagram below. The test was carried out using Intel NASPT utility, version 1.7.1. According to the suggestions by Intel, we intentionally reduced the RAM size on the test PC in order to carry out these tests. The measurements were taken for four file systems, while the data carrier has been successively connected it to USB 2.0 and 3.0 ports. The built-in VPN server allows connections using two tunnel protocols. At first we decided to test access speeds of a remote client to the local network located beyond the router upon usage of PPTP. The measurements were taken in the same three modes used for PPTP earlier. As a matter of course, we decided to test it upon connection of OpenVPN clients with AES256 encryption. We believe that the most interesting tests for our readers will be the ones we did in wireless networks. 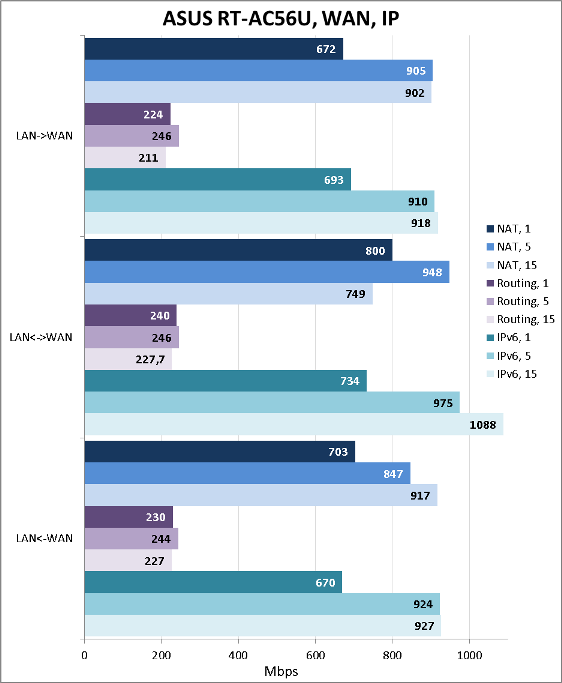 We tested data transfer speeds by IEEE 802.11n standard in 2.4 GHz frequency range (with the channel width of 40 MHz) and in 5 GHz frequency range (with the channel width of 80 MHz), however using IEEE 802.11ac standard draft this time. Results of the measurements for the two wireless frequency ranges are presented on the diagram below. 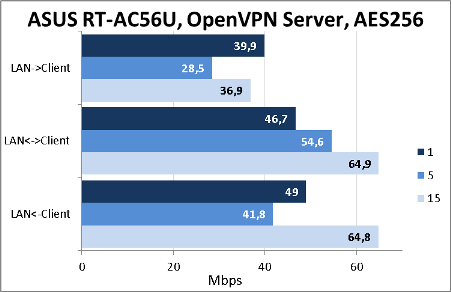 When this article had already been completed, we decided to find out what the end users actually think about ASUS RT-AC56U wireless router. As it turned out, one of their main concerns was the heat rising. But what's actually this heat rising and how was it measured? Chips this device is powered by possess certain undocumented functionality: showing temperature of the CPU and wireless modules. That's where we decided to test it ourselves. At first we used the router card we removed out of the device case. According to the data of diagnostic instructions, the CPU temperature was 63°С, while that of the wireless modules reached 46°С and 60°С. Unfortunately, we have no information about where exactly inside of the chip these temperature sensors are installed and how correctly they are adjusted. As far as we managed to figure out, these sensors are meant for the internal use by protecting the chip from heating up. Chip temperatures of up to 120°С are considered regular. However, how high are the measured temperatures? We used a special-purpose Testo 845 pyrometer that we have at our lab to measure the temperature around the chips. According to our measurements, the card temperature hasn't got higher than 58°С. During measurements the environment temperature was 24°С. Once the measurements were finished, we installed the router card back into the case and measured it once again. This time the figures turned out to be higher. After that we decided to measure the temperature inside of the device case. It hasn't got higher than 42°С, which is a pretty regular figure for home wireless routers. Based on our measurements, we can tell that the user concerns on the possible heating up of the device are not reasonable. And though the showings of sensors meant for internal use are not that exact, they still fall within the limits of acceptable temperature range. In other words, one should not worry about the high temperatures. 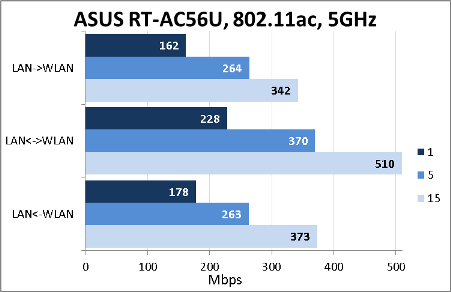 Generally, we are glad about ASUS RT-AC56U wireless router we tested. Even though it is as not efficient as its older counterpart, RT-AC68U, it's much cheaper. Appearance of OpenVPN client and server support may come in handy for some customers who, due to this or that reason, are not satisfied with access through PPTP. 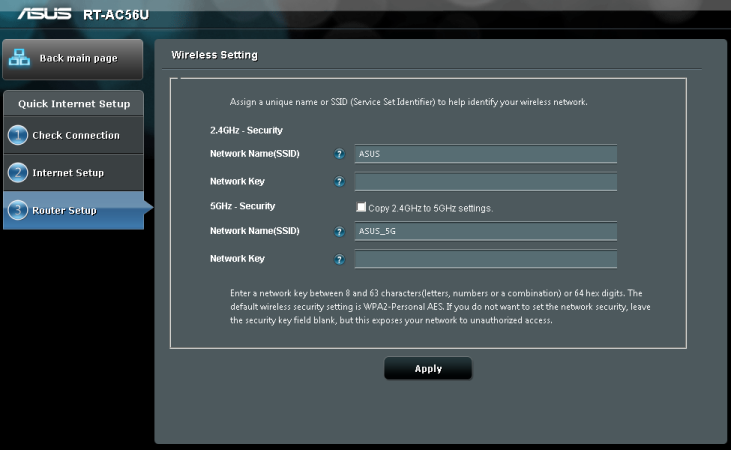 The strength areas of ASUS RT-AC56U wireless router are presented below. 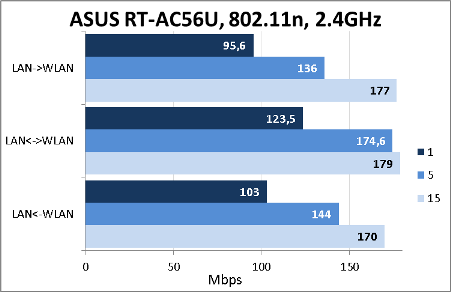 As of when this article was being written, the average price for ASUS RT-AC56U in Moscow online shops was 6000 roubles.